You’ll know exactly where you stand with our excellent floor mat service! Walk-off mats for inside entryways, to remove residual soiling. One-square yard of commercial carpeting can accumulate one pound of dirt each week; two pounds in wet weather. They remove dust from the air, improving air quality. 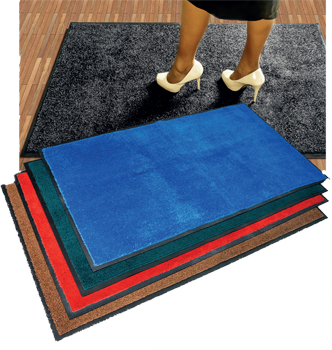 Wet area floor mats for use where spills or moisture accumulation is likely; to protect against slips and falls. Anti-fatigue mats to help reduce muscle fatigue and joint pain for workers who stand for lengthy periods of time performing tasks. Custom logo and message mats for use as powerful and economical advertising tools to display your logo, design, or message. In-house maintenance can be costly. Doing it yourself also reduces the effectiveness of the mat as only 10% of dirt is removed from the mats with a vacuum cleaner. Professionally cleaned floor mats can capture 70% of the dust and dirt tracked into a building.